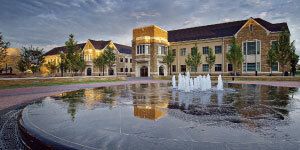 The University of Tulsa is a private, independent research university featuring personalized study in business, natural sciences, technology, engineering, math, health sciences, the fine and performing arts, and the humanities. Majors, minors, and certificate programs available through TU’s Kendall College of Arts and Sciences, Collins College of Business, the College of Engineering and Natural Sciences, and the Oxley College of Health Sciences are designed with your future success in mind. TU offers flexibility for students interested in interdisciplinary studies in and across all Colleges. It is not uncommon for students to graduate with a double major or self-designed major based on career goals. The University of Tulsa is a private, independent research university featuring personalized study in business, natural sciences, technology, engineering, math, health sciences, the fine and performing arts, and the humanities. Named by The Princeton Review, Fiske Guide to Colleges, and Forbes as a top national university, TU also made U.S. News & World Report’s 2018 top 100 list. TU’s four undergraduate colleges—Arts and Sciences, Business, Engineering and Natural Sciences, and Health Sciences—emphasize professional preparation in a traditional liberal arts context, while the Graduate School and College of Law offer study at the master’s and doctoral levels. More than 90% of first-year TU students receive some form of financial aid, and 95% of 2017 graduates accepted jobs or enrolled in graduate school within six months of graduation. The academic environment at TU emphasizes individual challenge and faculty mentoring. The result of this rich formula is evident each spring. TU students receive more nationally competitive awards than all other Oklahoma universities combined, including Udall and National Science Foundation Graduate Fellowships; Goldwater, Truman, and British Marshall Scholarships; Fulbright Grants; and a 2017 Rhodes Scholar. The University of Tulsa is fully accredited by the North Central Association of Colleges and Schools. TU is an NCAA Division I participant through the American Athletic Conference. TU’s noted programs include Pre-med, Global Scholars, Cyber Corps, Third Floor Design, Make a Difference Engineering (MADE at TU), and the Tulsa Undergraduate Research Challenge. The Office of Global Education matches students with the perfect study abroad opportunities. Experiential internships are offered locally, nationally, and globally. Students who have a passion for the discussion of ideas will find TU’s Honors Program an engaging option of integrated courses that examine major epochs and ideas of Western civilization. Unique academic majors like Anthropology, Arts Management, Athletic Training, Computer Simulation and Gaming, Deaf Education, Energy Management, Engineering Physics, Environmental Policy, Film Studies, and International Business and Languages distinguish TU from other schools. The University’s 220-acre bike-friendly campus is located in the heart of a metropolitan city of about 400,000 residents. In the past 15 years, more than $200 million has been invested in campus building projects. A newly renovated Student Union opened in fall 2014, and a new 300-bed all-suites residence hall and student center opened in fall 2015. Other recent additions include two new engineering buildings, the Lorton Performance Center, Chapman Stadium, Collins Fitness Center, student apartments, and a 34-acre recreation complex. Academic resources include dedicated spaces to study financial risk management, fiber-optics networking, museum archives, animation, physical rehabilitation, and digital video editing. TU also boasts off-campus facilities such as the Zarrow Center for Art and Education in the trendy Brady Arts District; the North Campus engineering complex, with real-world energy industry equipment; and the Helmerich Center for American Research, which works with the renowned Gilcrease Museum to examine documents and artifacts that tell the history of the Americas. In 2016, the Oxley College of Health Sciences moved into a renovated building with state-of-the-art classrooms and labs located about 10 minutes from campus. 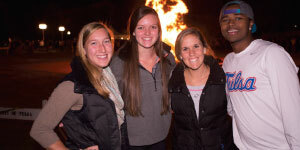 With more than 200 student organizations, TU offers ample extracurricular opportunities such as intramural sports, special-interest clubs, academic and pre-professional organizations, national fraternities and sororities, and religious groups. 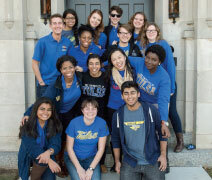 TU’s True Blue Neighbors program gives back to the community through several organizations. Last year alone, TU students, faculty, and staff volunteered 75,000+ hours to make the city of Tulsa an even better place to live and study.